Hortafix Bird Nest Box (Cedar) and Nestbox Colour Camera with Infra Red and Audio | The Best Spy Tech Store Online! 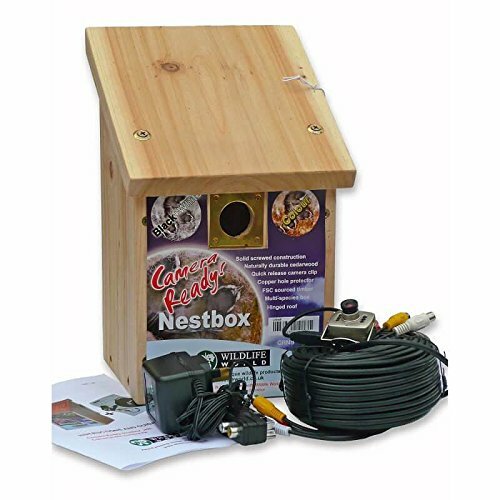 What better way to understand and enjoy the birds that come in to your garden than to erect this Colour and Infrared Camera Nestbox which not only gives your feather friends a warm and dry place to nest, but also houses a multi-function camera. This is a robust starter kit for watching and listening to wild birds in the nest during the day and at night. The nestbox is made from solid FSC naturally durable timber with a pitched roof and camera clip secured in the roof. It has a 29mm copper hole protector and perspex panel on the side to improve camera colour resolution. FSC Certified wood. Colour/Infrared camera. 30m cable and Scart adapter included. Power adapter included. Watch birds during the day and night. The CMOS colour/infrared camera operates in high quality colour during daylight and then switches to black and white in low light levels and darkness. The nest box has a side window to increase light into the box and boost camera performance. The super mini camera is ideal for wildlife and domestic installations such as nest boxes, hedgehog houses, bat boxes, insect houses and covered bird feeders, or domestic pet surveillance, aviaries, stables, hutches etc. The camera is connected back to your TV set or monitor via a 30 metre screened cable and into the supplied scart adapter. Power is supplied to the camera via a low voltage power adapter also included in the kit. Dimensions of the Nesting box: W22.5 x D21 x H34cm Dimensions Of the Camera: W2.7 x D1.5 x H3.5cm Cable Length: 30 meters Voltage Rating: 12 volt Camera Type: CMOS Differentiating Rate: 700 TV Line Customer Note: The super mini camera is not fully waterproof so should not be used outdoors with no protection or housing.